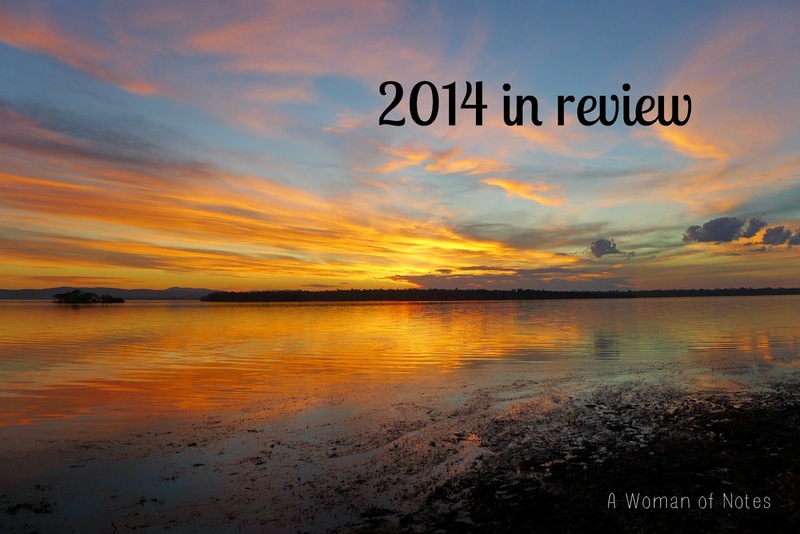 I thought I'd try and summarize our year of 2014 in words and pictures. The photo above is from our holiday at Green Pt, one of many, many incredible sunset shots I got. I think photographing those sunsets was definitely one of the year's highlights for me. Of course, not every up and down in a year, or even every event, is captured by a camera, even in this day and age. Some months I took very few photos. 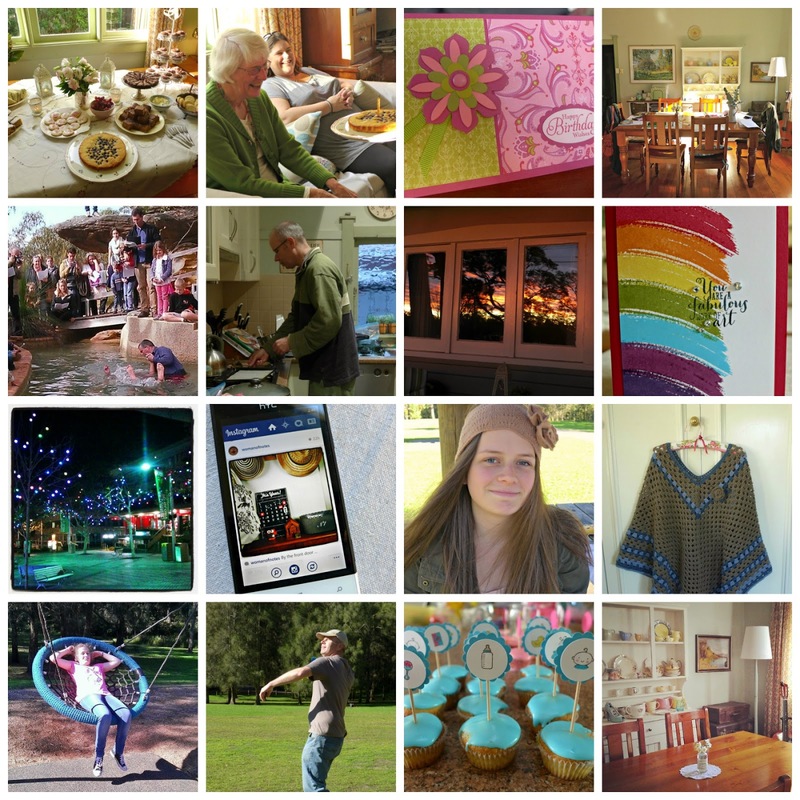 And when I think back on the year, a lot of it is a blur of the everyday. The chores, the emotions, the busyness, and the unstoppable forward motion of it all. 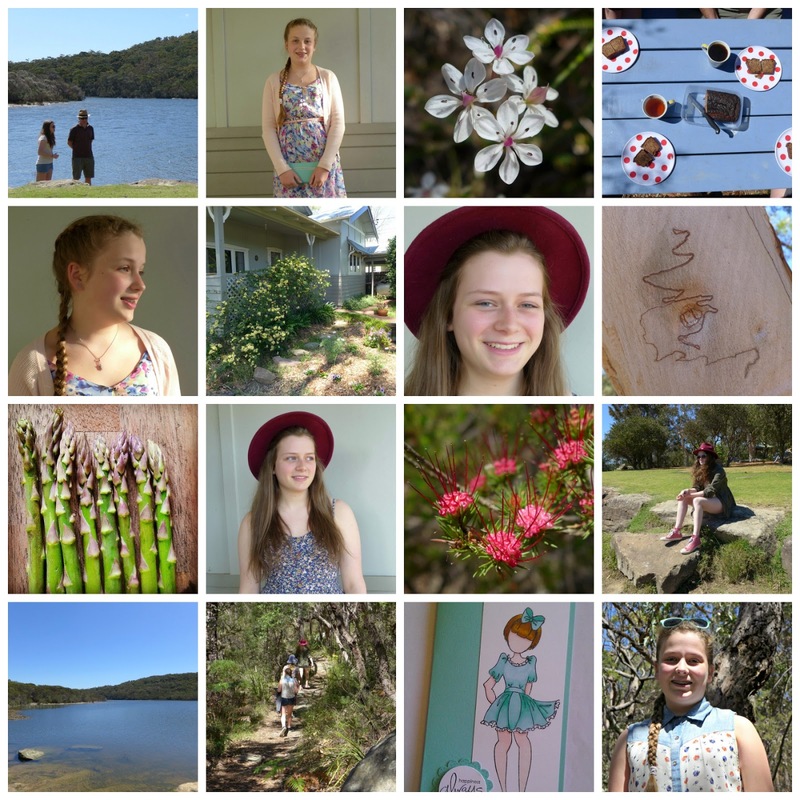 In January we celebrated Emily's 17th birthday with a shopping day (she had had her party in December). Emily tried her hand at growing beans, with help from Gran. Steve and I went to the Q Station for a much-needed weekend away, and enjoyed each other's company and the beautiful surrounds. With the girls we headed to Brooklyn one day for a picnic. But before we knew it, the holidays were over and it was time for school again, with Emily in Yr 11 and Laura in Yr 9. Thinking and relaxing time was over. 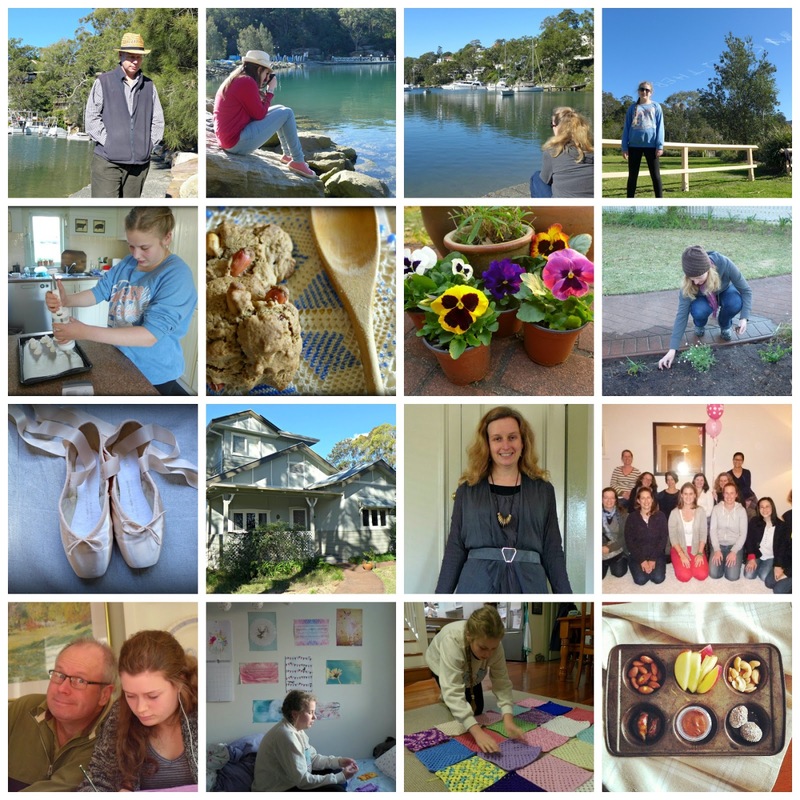 In February it was really time to put my resolutions and routine into action. 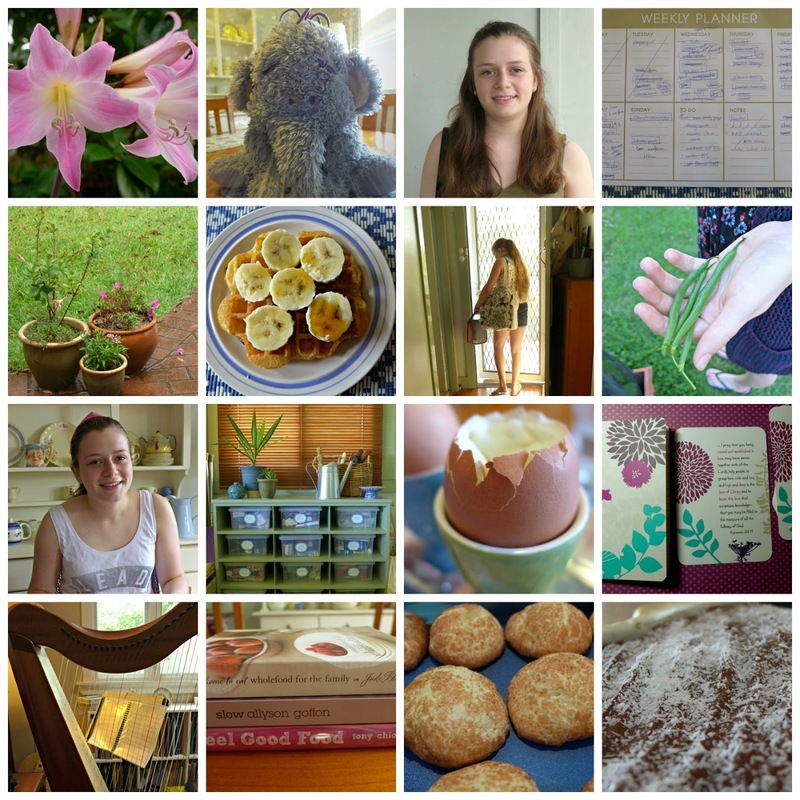 I got various areas of the house tidied up, and enjoyed gluten-free waffles and other baking, little realising that within the year that was all to change ... Bible study started up again, with me leading the same group of lovely friends, plus one new girl. I also had 10 or so piano students, plus taught theory and my recorder group. The weeks were busy. The month began with an outing for Steve and I, dinner and a concert (Altan & Lunasa). A very rare occurence! 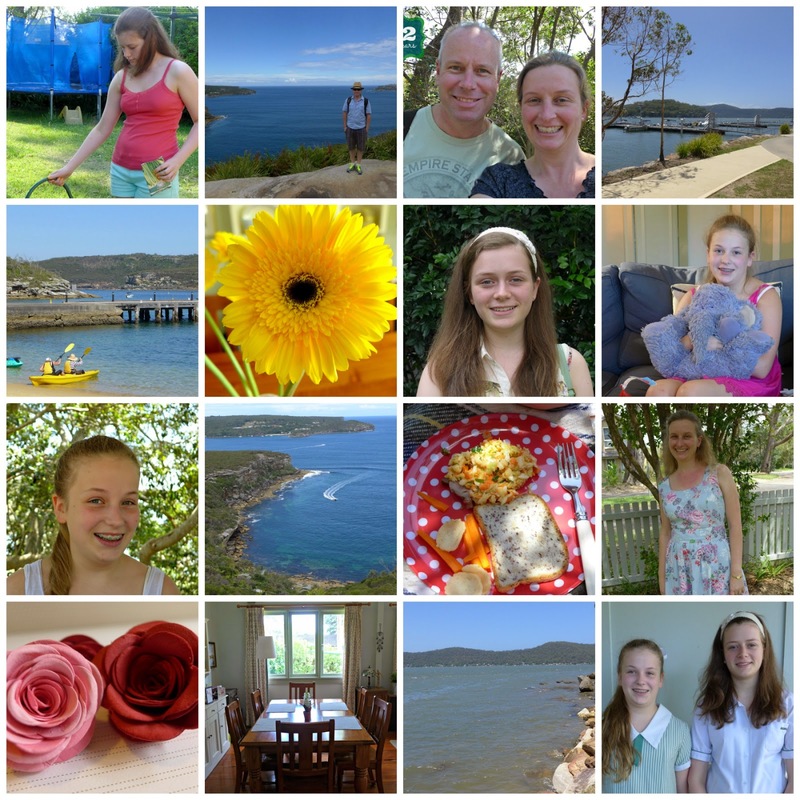 We all had a picnic at Bobbin Head one Sunday after church to celebrate Steve's birthday. On his actual birthday he took Emily & co. to a concert at the Opera House. 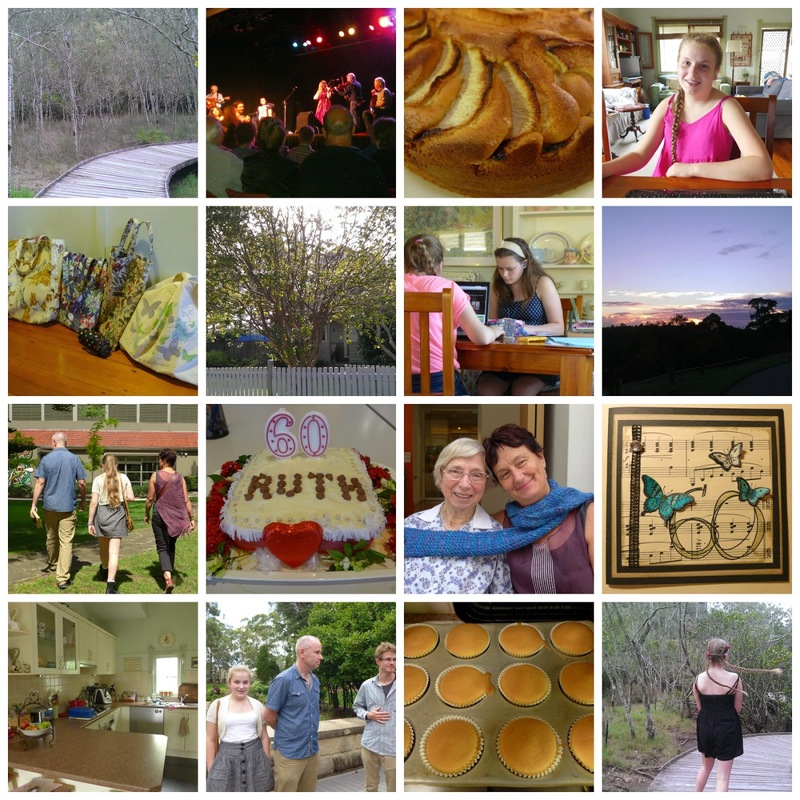 Steve's sister Ruth celebrated her 60th birthday with a big family lunch in a lovely location. I struggled with my full-on Thursdays, coping only with careful planning and many bags for each part of my day (eventually I would have to give up the harp lessons). Emily got stuck into her schoolwork. In April, my Dad turned 75, and we celebrated with a lunch here for family. I began crocheting a poncho. Emily bought some lovely pencils, inspired by her study of Visual Arts. We girls went to a ballet rehearsal and performance at the Opera House. 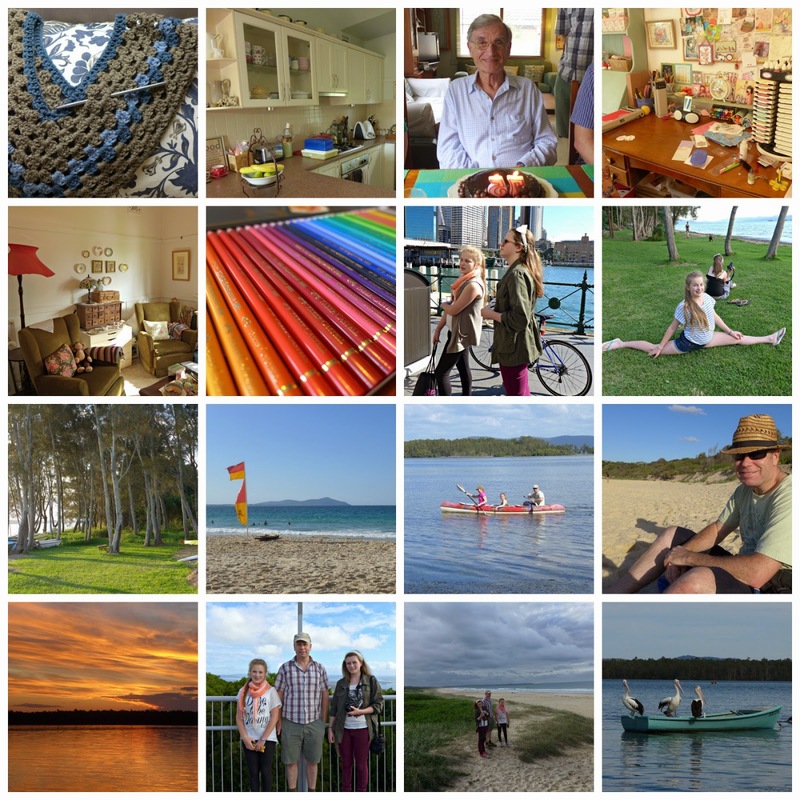 We all spent a wonderful week at Green Pt, near Forster, where we truly relaxed and recharged. During this week I started wearing glasses for the first time in my life. I tried not to think about my ear surgery but it eventually happened on 30th April. May for me was very much about recovery from ear surgery. I came home on 1st May and spent many hours on the sofa. After the initial difficult first days, I continued to feel dizzy and foggy in the brain for the next 5 weeks, much longer than the doctor (or I!) expected. On top of that, I wasn't coping well at all with reading glasses, so reading was out of the question. 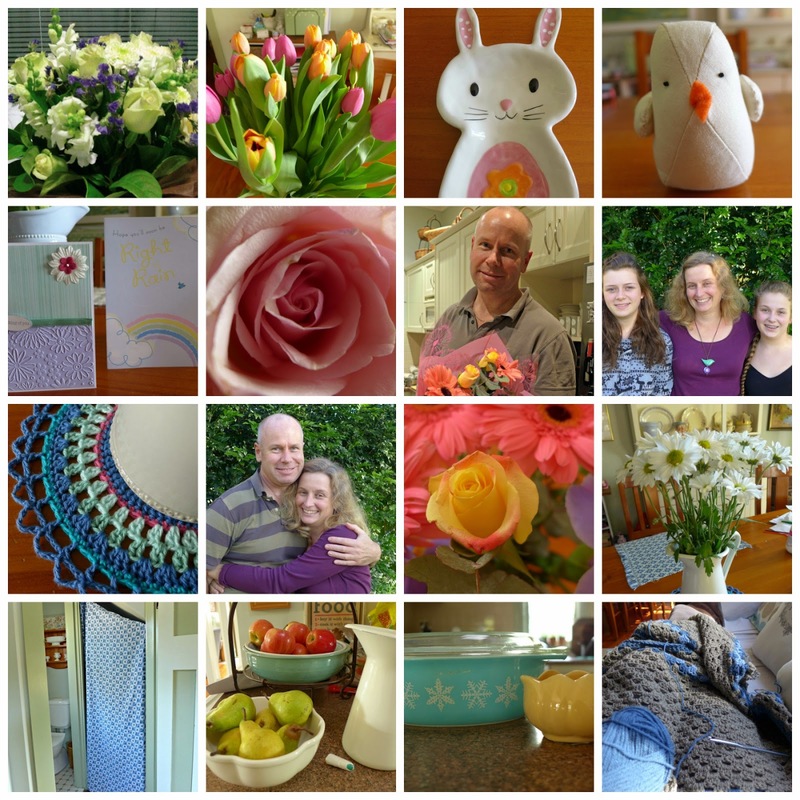 It was a very difficult and frustrating time, but that was countered by much guilt-free daytime movie-watching, flowers and cards from friends, and being spoilt by my family on Mothers Day. When I could, I crocheted my poncho. 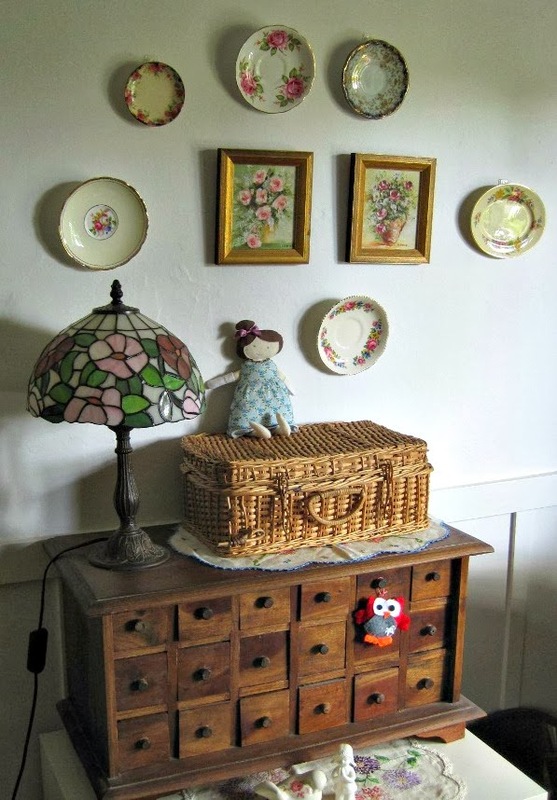 Some days were better than others, I managed to sew a curtain over the broom cupboard one day but couldn't manage much for days after that. Life went on for the rest of the family, with Steve having to do all the cooking, driving, taking the girls to band camp, etc plus looking after me. The best thing of all was that my surgery had been a success - I can hear again in my right ear, and there were no complications in the post-op period, I was so thankful to have one of the 89% successful stapedectomies. By the second week of June I was starting to feel much more normal again, and got right back into everyday life. It was interesting to experience everything with new eyes (and good hearing!) having taken a break from it all. I gave up ballet (still too dizzy and the class was folding, anyway) and didn't ever make it back to a harp lesson. Without these two activities my week seemed much more manageable and less stressful. I had also learned that it is possible to actually give up ALL one's activities for a time, the world doesn't really rely on me as I much as I thought! A good lesson. The girls and I enjoyed our church weekend away and a very special baptism, all making me more thankful than ever for our church family and the friendships God has given me. Our family had a great picnic at Crosslands at the start of the holidays, and Steve and I had some nice nights out while the girls stayed with my parents for a few days. We looked forward to the birth of my cousin Nicole's first child. 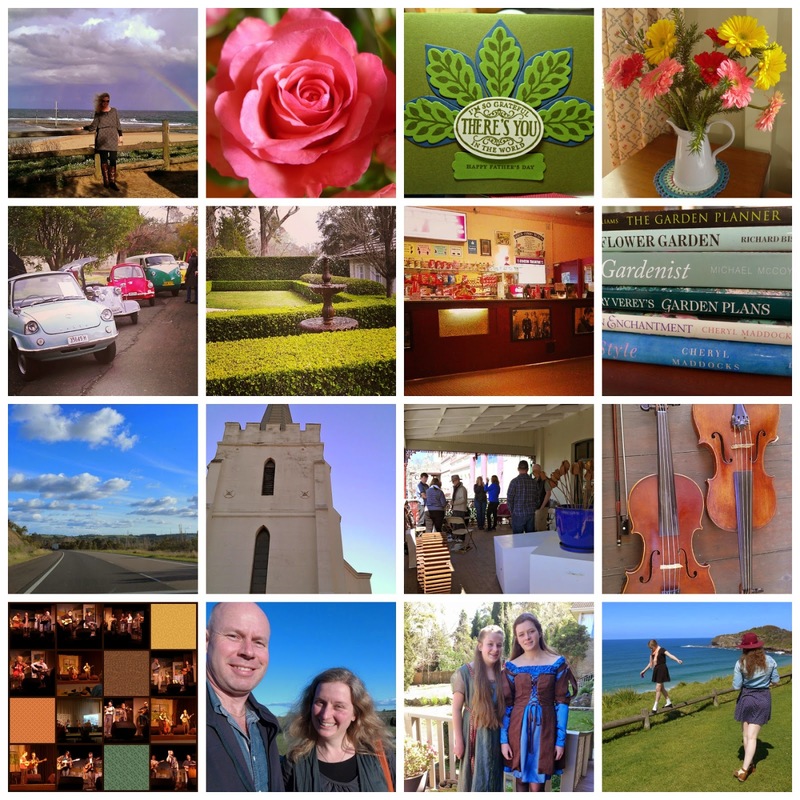 I began to Instagram in earnest, and loved it. July began with another picnic, we really do have such lovely picnic spots in Sydney, and sunny winter days are perfect for enjoying them. Steve and I got stuck into gardening, digging up and replanting the front garden bed that had been empty for some time. I bought some new clothes which served me well for the rest of winter, I loved them so much. Nicole had her baby, a boy, Jamie. Tanya had a birthday, and Emily got demipointe shoes. Laura crocheted incessantly, which provided her with an activity when the anxiety hit. School attendance wasn't great in these winter months, but things were a bit easier than last year. Laura and I started seeing a chiropractor who addressed our problems holistically, and this was the start of a long process hopefully leading to some healing. I so much enjoyed being cosy at home in these winter months. In August the garden started to bloom. I began seeing a nutrionist, as advised by the chiropractor, and this led to a drastic change in diet, away from Failsafe and towards a more Paleo approach. With the help of supplements and chiropractic I was once again able to tolerate a large variety of fruit and vegetables. Sugar and starches were out, however, which provided many challenges at snacktimes. Feeding Laura became complicated, and mealtimes and menu planning are difficult, even now, 5 months later. Over the next months I gradually lost 6-7kgs. During August the piano was in demand as Laura practiced for her 4th grade piano exam, and Emily and I worked on her pieces for her 7th grade saxophone exam. I was also preparing two students for 8th grade. Laura did well in her piano exam. Emily sewed butterfly wings for weeks for an art assessment, and I enjoyed making some baby nameplates with diecuts and punches. In September I turned 45, and celebrated with 3 movies in one week, including seeing the lovely One Hundred Foot Journey twice. We celebrated Fathers Day. 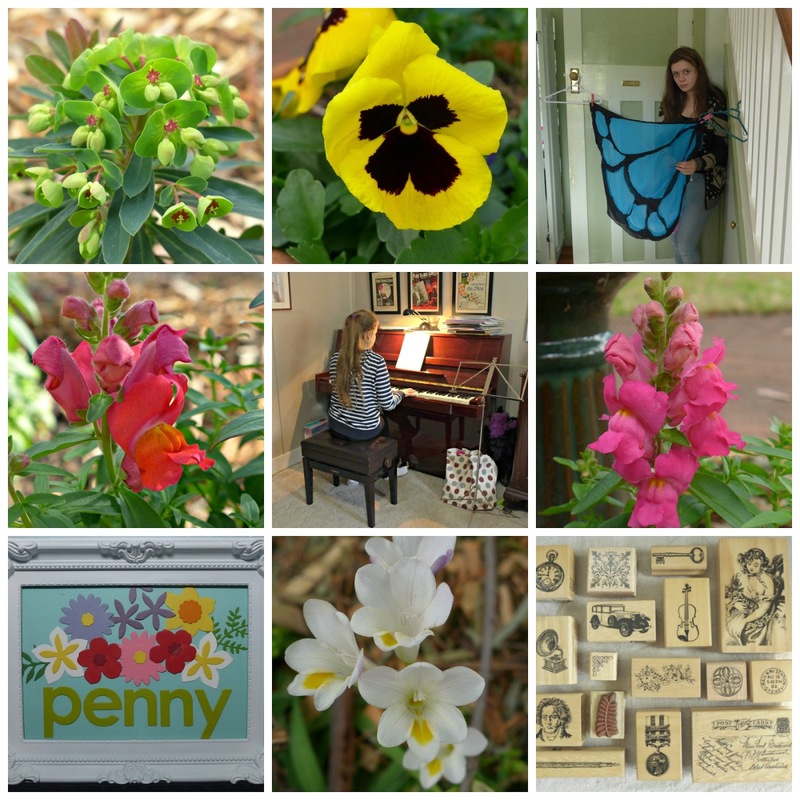 With spring in bloom, I was still excited about gardening, reading many garden design books and visiting an open day. Emily's saxophone exam was postponed due to a bout of gastro. Before we knew it it was school holidays again. Steve and I headed to Yass for the Turning Wave Festival of Irish music, and had a wonderful weekend, while the girls stayed with my parents and visited a Medieval Faire, in costume. 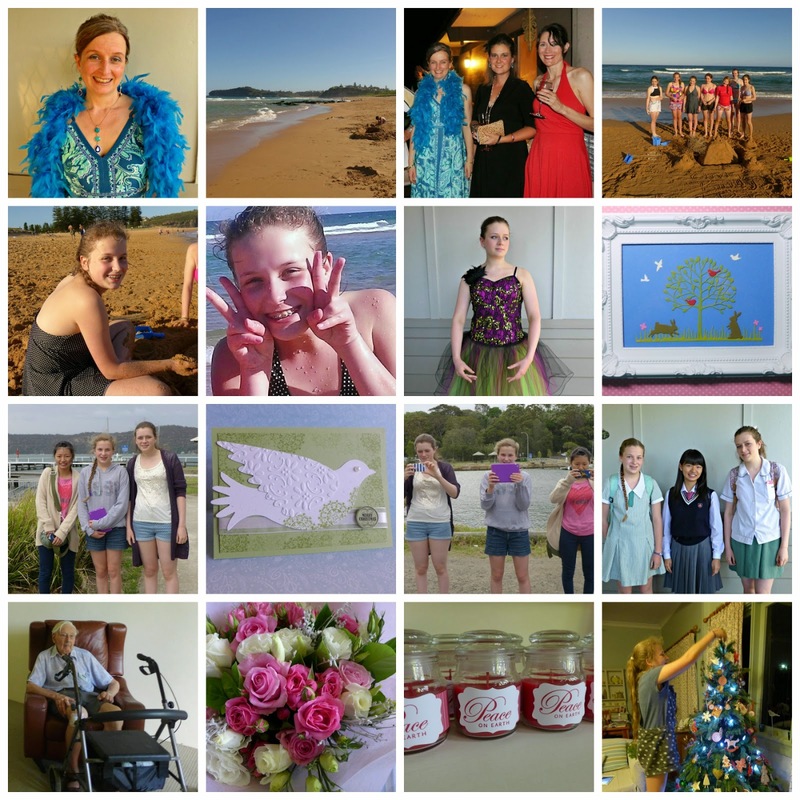 We kept seeing our chiropractor, by now into our 3rd month of frequent trips to Mona Vale. In October we had yet another lovely picnic. Laura saw Wicked with friends, and Emily dressed up for a high tea party. I enjoyed much crafting, starting to think about Christmas cardmaking. Steve played a lot of music, something he was able to take up again after I recovered from surgery. Every few weeks he gets together with various friends to play quartets, quintets, trios ... A concern during this month was Steve's parent's wellbeing, with his mum having surgery for cancer, but with excellent results. November 1 saw me dressing up in a feather boa for a very fun James Bond party for Matt's 40th. Our baby turned 15! We took her and her friends to the beach for a fun and relaxed birthday party. The following day, Emily danced in her ballet concert. One of the best things of the year was our Japanese homestay student, Hikaru, visiting. I'm so glad I persisted with that idea! This was a great thing for our family to do, we loved Hikaru and had 5 days of fun with her, which was over all too soon. During this month we helped Steve's parents a lot as they managed everyday life after hospital, and thought about future accommodation, and were thankful for Steve's siblings also doing much for them. I ran a cardmaking class for 30+ women and girls at church, an annual huge planning and preparing exercise for me. December came around quicker than anyone could have imagined. I loved our Christmas decorations and lights, and had so much pleasure from seeing them each day. In early December we very sadly farewelled our wonderful minister and his family, who have moved to South Africa. Once again we were aware of our godly friends and close community at church. Laura danced in her ballet concert. I finally finished stamping and then writing 80+ Christmas cards, and posted them with much relief in the middle of December. Only a few cards trickled into our letterbox, but it was lovely to hear from some old friends and family we don't see much. During December I tried to keep up with some Advent readings, but some days were "too crazy", what with recorder performances, end-of-year dinners, presents to buy, and so on. One thing I finally managed to do (after many years thinking about it) was to host a street party on the Sunday before Christmas. We had about 30 people come and it was a great night of catching up with neighbours and meeting others. I really hope to build on these relationships, now that I've begun. 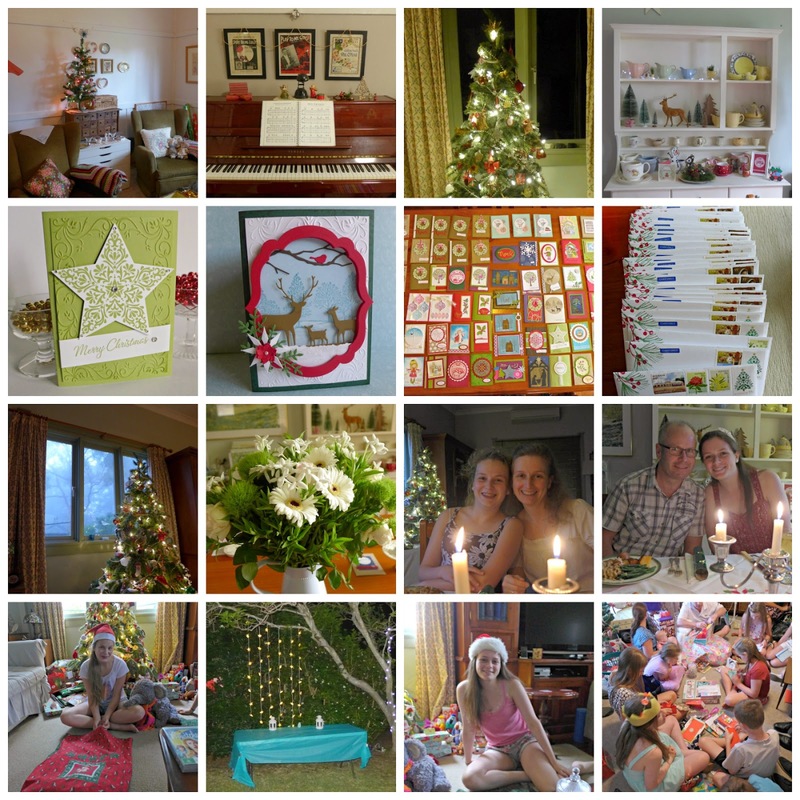 Christmas itself was good, with a lovely Christmas Eve meal at home and the full family shebang on Christmas Day. Then the wonderful Boxing Day, when we could just stop at last. I now have a pile of recipe books from which to make paleo menus. My health seems much better than pre-July, although my digestion is still not quite right. Steve's dad moved into new accommodation in the last few days, so Steve has been busy helping him set up his computer and so on. We girls have been sitting, reading, Instagram-ing ... and New Years Eve saw Laura's friend Jess come to stay the night. It was a hard year, in some ways. Once again my 'everyday' seemed very much focused on my health. Which is something I hope to move away from in future. I'm very happy with the mostly-paleo diet (and hope to convert Steve and Emily to it over time) but I don't like having to keep track of what foods affect me how, and what is causing this ache or tummy upset. And figuring out meals is really hard! There are better things to think about in life! I'd love to reach a stage where health and meals feel 'under control' and just move on. Laura keeps us on her toes, but is also a delight. When she is happy, everything is good. Emily has worked hard all year, and is a lovely girl in every way. Steve has plugged away with his many responsibilities, and I really shouldn't complain inwardly when he falls asleep in front of the TV each night. I hope I have matured, become more Christ-like and wise, and feel I have learnt some valuable lessons this year. So ... bring on 2015, and whatever it might bring! I don't expect many changes to our daily life, but by the end of the year, Emily will have finished school! So there are big changes ahead for her, and big challenges in the meantime with the HSC looming. Well done for sticking with this very long post to the end, and I wish you and your family a wonderful 2015! So good to see your year.